The University of Chicago is selling the home of Zaleski and Horvath and Packed in the latest round of sales of residential properties. 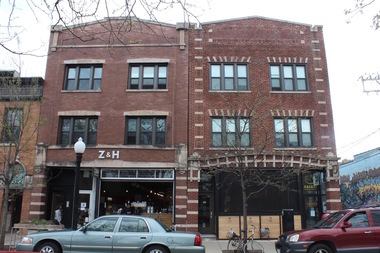 HYDE PARK — The University of Chicago is selling another 13 properties around campus, this time including some of its retail buildings on 57th Street. The university is selling 10 buildings containing 387 units, two vacant lots and a retail building in its latest round of selling off properties in Hyde Park. For the first time, the university is selling off its retail holdings, many of it in prime locations close to campus. The university is putting all of its buildings on the 1300 block of East 57th Street on the market, which include spaces for Noodles Etc., Zaleski and Horvath, Medici and Packed, which was wooed to the neighborhood by the university earlier this year. Many of the remaining large university-owned apartment buildings will also be sold, leaving the university with just 13 residential buildings housing students, faculty and staff, according to the university. Last summer, the university sold off 21 properties containing more than 600 units for a reported $70.1 million and then put three dormitories on the market in June in a second round of property sales. Jim Hennessy, the university’s associate vice president for commercial real estate, said the university was holding the properties to ensure there would be stable, quality housing for students, faculty and staff near campus. “As demonstrated by the university’s sale of residential properties last summer, the real estate market in the areas surrounding campus is now strong enough to attract a number of potential investors and support a range of residential options,” Hennessy said. Like the earlier sales, leases will be honored for all current residents. It’s unclear still what will happen when many of the leases expire and the new owners are able set new rental rates. Early reports from renters indicate rents could go up in some of the more desirable locations and some apartment hunters have reported rents going up by 50-100 percent. This newest round includes some of the largest buildings housing university students, faculty and staff. The Picadilly, 5107 S. Blackstone Ave., is 76 units in a 12-story tower close to the new City Hyde Park development, which has brought the rental rates of the South Loop, Bucktown and other desirable neighborhoods to Hyde Park. The university does not own Medici's main restaurant at 1327 E. 57th St., which continues to be owned by the family of Medici founder Hans Morsbach, but does own portions of the Medici's bakery and coffee shop in the neighboring building.